Today the story of the Winecoff Hotel fire was told on the campus of Southern Maine Community College. 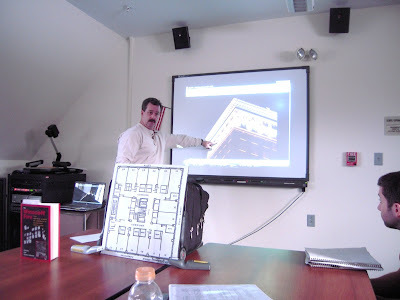 Portland, Maine firefighter Beau Gros was a guest lecturer in the "Fire in American Society" classroom. He described for students the tactics used to fight the fire. He also discussed rescue strategies, many devised by the hotel's guests themselves. 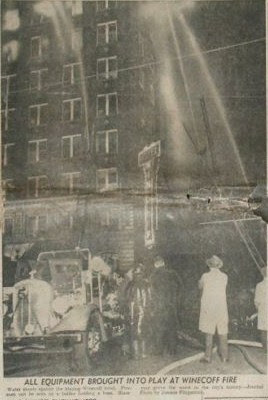 The co-authors of The Winecoff Fire: The Untold Story of America's Deadliest Hotel Fire were pleased to assist Gros with his preparation. Wrote Gros afterward, "I received a great response to the class. Thank you SO much for all your assistance and encouragement. I can definitely see myself teaching this and other American fire stories into the future." That's good news for fire safety because there's no shortage of lessons to be learned from the Winecoff fire.